Ajanta - A visual Delight ! Day 3, and we renewed our rendezvous with history with a visit to Ajanta. Seen from a distance, Ajanta caves look like a giant beehive in the shape off a horse shoe. These caves served as a retreat for the Buddhist monks where they could introspect and study without any one disturbing them. 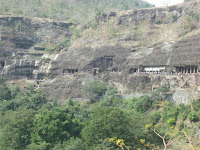 Perhaps that is why the Ajanta caves were built deep in the mountains and are not as conspicuous as the ellora caves. These caves were discovered by an Army Officer of t he British Army in 1819 during one of his hunting expeditions. The trip to Ajanta was slightly more tiring than Ellora in the sense that in Ellora one just has to walk the short distance from one cave to another whereas Ajanta requires a tedious process of first standing in line to get in a bus that takes you uphill in a 10 minutes ride. Then you get off and start trudging up a path to the actual caves. Once again we were very lucky with Piya’s selection of Guides. She had taken great pains to ensure that people from the Archeological survey of India were there to show us around. The ASI staff explained to us the painstaking process they follow to restore the paintings. The effort they are putting in is indeed commen dable. I honestly don’t remember much about which cave had what painting. What my mind registered was more like a kaleidoscope of paintings and bright colors. What struck me immediately was the choice of colors. Very bright, and for some reason Red and Green were predominant.The most famous paintings are off course of Padmapani and Vajrapani which have become the face of Ajanta to the world. The paintings at Ajanta are not just individual paintings but they are full fledg ed stories depicting incidents from the life of Buddha and the Jataka tales. Its like walking through the cave and reading a story through paintings. Even the minutest of facial expressions in the paintings has been so masterfully painted that its like watching a live drama with live characters. Apart from paintings,Ajanta also has some fantastic sculptures and carvin gs. 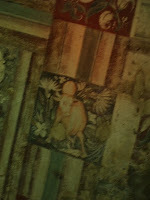 One sculpture which is particularly outstanding is that of a Quadripartite deer carved on a panel. To a casual observer it seems that the four deer have four different heads but actually there’s just one head between the four deers. ASI does not allow the use of flash inside the caves so the quality of the snaps we took was not too great but Ajanta was a real visual treat for all of us !